HamAntCal+ will calculate to feet/inches, feet with a decimal point, inches only below 10 ft if desired and metric. 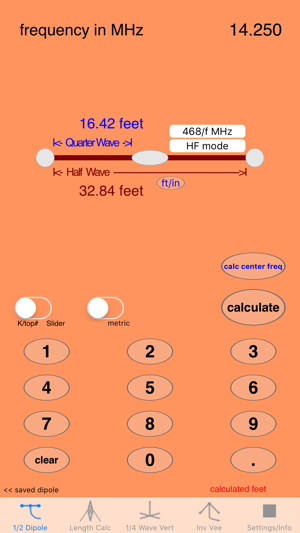 HamAntCal+ has a neat new interface, just swipe to the left to access up to 6 saved antenna calculations. 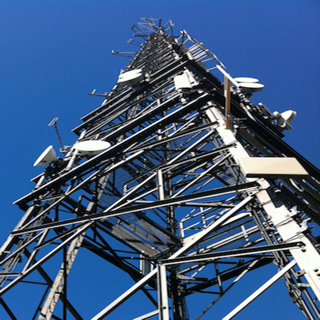 You can calculate for an antenna in free space or enter a high and a low frequency in a band and calculate for a frequency centered between the 2 frequencies entered. A diameter slider has been added to enter antenna element diameters up to 1” to adjust for antenna element length based on the diameter of the element. You can change the top number in the formula 468/f MHz from 463 to 492 above 30 MHz for the VHF range and the UHF range up to 500 MHz. The K multiplier can also be set as in the formula 492*K/f MHz, where K is equal to a number from 0.941 to 1.0. 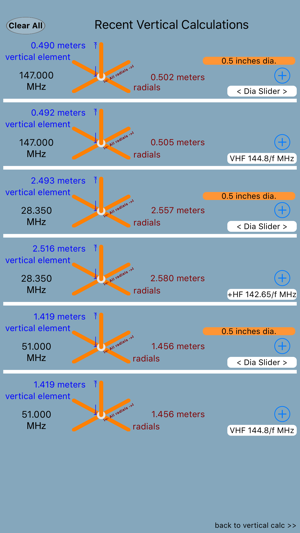 HamAntCal+ calculates for Dipoles, Verticals, Inverted Vee’s and Free Space calculations. 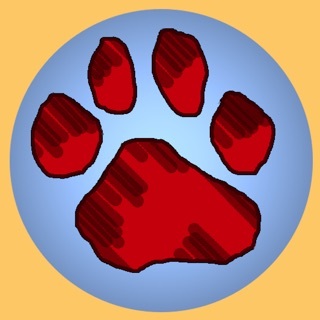 HamAntCal+ will work for iOS 6.1 and above and is also designed as a universal app for the iPad. 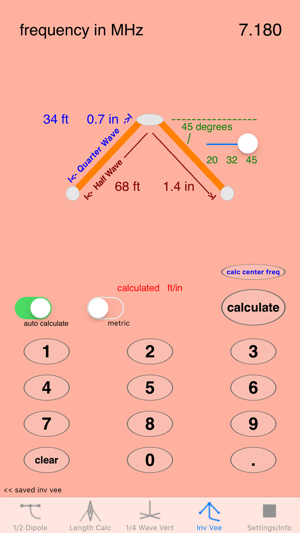 •HamAntCal+ will calculate in metric as well as feet/inches. •The calculated outputs are in feet and inches, feet, or metric. 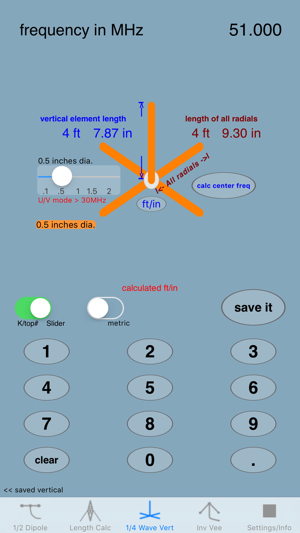 Less than 10 feet can be set to ft/inches or inches only if desired.•After calculation by either automatic calculation or pressing calculate the calculate button changes to “save it”. Pressing the “save it” button will save the current calculation to the saved page and the “save it” button will change back “calculate”. •With autoscroll set to “ON” the last 4, 5 or 6 calculations are saved (depending on screen size) and the oldest calculation is removed to make way for the new. With autoscroll “OFF”, after 4, 5 or 6 calculations are saved they will remain unless you press "save last" or "clear" on the saved calculations page. Touch the plus button on any saved calculation to copy that calculation back to the calculator page. 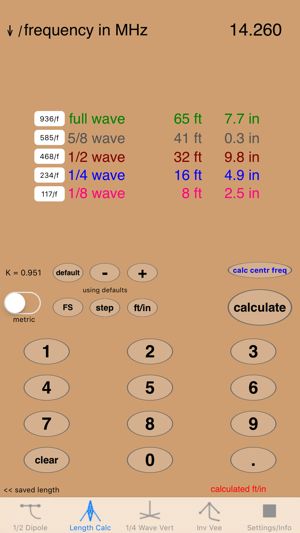 •To use this antenna calculator just enter the frequency in MHz. 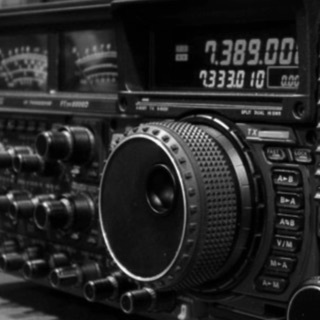 For example you can enter 3.5 for 3.5 MHz. You can also just enter 7 for 7.0 MHz then press "calculate", no need to enter the decimal point or zero. After making a calculation there is no need to press "clear", just enter the new frequency and press "calculate". •With "Automatic Calculation" ON, the result will be calculated automatically after the third or fourth digit after the decimal point (automatic calculation is the default mode at startup). •To calculate an antenna length that is centered between a high and a low frequency in the same band, press “calc center freq.” then enter the lower frequency then enter the higher frequency. The result will be an antenna length based on a frequency centered between the two numbers entered. •This calculator does not give exact measurements and the results will need to be trimmed using an antenna analyzer or SWR meter to the exact frequency after installation. Leave some extra wire on each section for trimming and wrapping around the insulators. •No antenna calculator can give exact results in every case. Much will depend on the wire used, the height above ground, the ground itself, nearby objects, etc…. It's always a good practice to add a little extra wire and then trim up to the desired frequency. •Although I have had good results using this calculator the results are not guaranteed. Always add some extra length and trim the antenna to frequency (it's much easier to trim than it is to add wire to the antenna). •Please be safe while building your antennas. Always use the proper safety equipment. 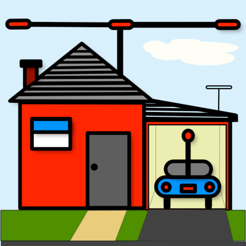 Never build your antenna where it can come in contact with power lines, this includes the supports as well as the antenna itself and the feed lines. BE SAFE! •Please feel free to contact me with suggestions, problems, compliments, ideas for improvements or additions to HamAntCal+. I like the look and feel. I have not tried any wire antennas yet to see how accurate it is. The few frequencies that I know length of antenna the calculations seemed dead on seemed to be dead on. I like to support hams doing development. I which we could get an NEC antenna modeling app on the iPad. The title tell the story quick and easy.